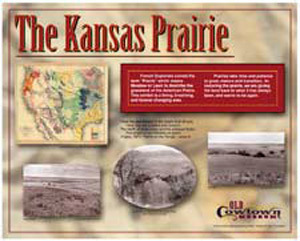 Traub Design Associates - "Pathway to the Past"
The new visitors center at Old Cowtown Museum in Wichita, Kansas, is connected to the living history exhibit space by a walkway approximately one-quarter of a mile long. It was the desire of the museum’s interpretive staff to make that walkway an opportunity to travel back in time and to prepare visitors to encounter their immersive experience in Old Cowtown, a replicated frontier town. Traub Design Associates was commissioned to create interpretive markers that would act as guideposts for the journey. The subjects for the markers were determined to be the setting (Why Here? 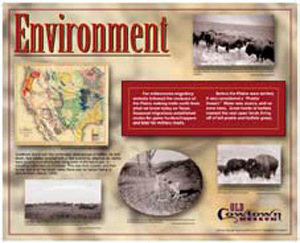 ), The Environment, The Prairie & Migration. Inasmuch as the area surrounding the pathway was not yet developed, visualization of the area was essential. readied for fabrication. The half-inch state-of-the-art phenolic markers were specifically chosen to withstand the heat, scorching sun and freezing cold of the plains of Kansas. They are currently standing alone as the educational pieces of the pathway to the past and will be even more effective as the areas are developed. Exhibition Size: 30 sq .ft.